Take Poach through a megafruity adventure to restore peace to Napple World and return to her own. Gather ’round and we shall tell you a tale. A fantastical tale full of magic and fun, where both are only limited by your imagination. Still here? Typically I wouldn’t be, but being insane affords me the opportunity to sample and learn about many different games and occasionally stumble upon the one really neat title that I regard higher than my own family. Luckily Napple Tale is both Japanese and by Sega, so this was an easy sell. 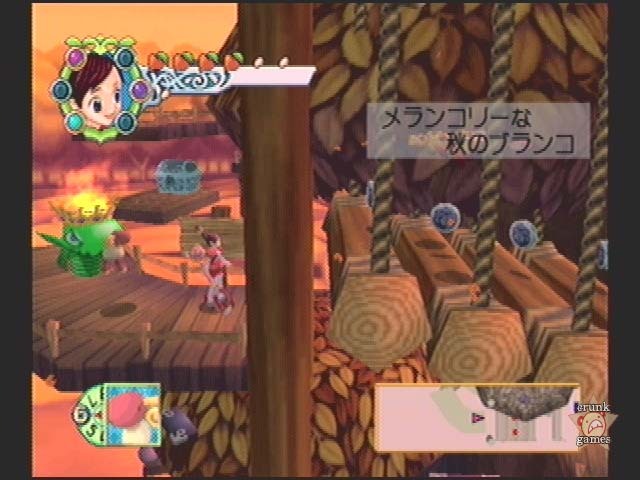 Napple Tale is an odd breed of game, but stands as proof of the Dreamcast’s eclectic library that became almost the norm during its tenure. To put it stupidly, this game is made by chicks for chicks. Yes, the creative staff has more women than usually present in a video game, providing us with a story and characters that are clearly the products of too much X-chromosome. But we digress; we’re all for women taking hold of a console game. After all, it’s a hell of a lot more refreshing than an overambitious group of Japanese women penning the latest in lifeless boy-love games or some suit-clad white ladies producing Lizzie McGuire print studios. Too bad good things come in small doses. Our story opens on a young girl named Poach Alisia (not Arsia as the title would lead you to believe), who has joined her friends at a local festival featuring circus acts and balloons and all that good stuff. Some strange things begin happening to Poach, with an odd ball of light encircling her and some sort of floating clown-thing keeping watch on her. A blast of light soon surges and Poach collapses. She wakes up in a black void but soon sees a sparkling gate beckoning her to enter. She does, and finds herself in an odd floating world complete with a new outfit that makes her look like a wind-up toy. She’s soon greeted by the clown-thing, who introduces himself as Straynap, a spirit guide (Poach nicknames him SN). SN tells Poach that she has been brought to Napple World, a realm that exists in between the world of the living and the world of the dead. It turns out that she doesn’t really belong there as she wasn’t meant to die yet. You see, inside each of us are mystical fairies known as Petals. When we pass on through Napple World, those Petals are scattered and returned to Napple World. With her Petals now accidentally gone, Poach naturally decides to reclaim them and return to the real world. However, it turns out it won’t be quite so easy. The center of Napple World, Napple Town, has been seeing some tragic occurances lately. Bound by the power of the four seasons where the Petals return to, Napple World now finds itself devoid of the seasons, causing an imbalance. So as you might expect, Poach’s quest becomes twofold as she joins up with Straynap and sets out to get to the bottom of things and recover her lost Petals. And yes, there is a great force of evil behind it all, and yes it turns out to be someone from Napple Town. Who it is I can’t say, but only because it’d be better for you to look at the screenshots if you wanted an idea. 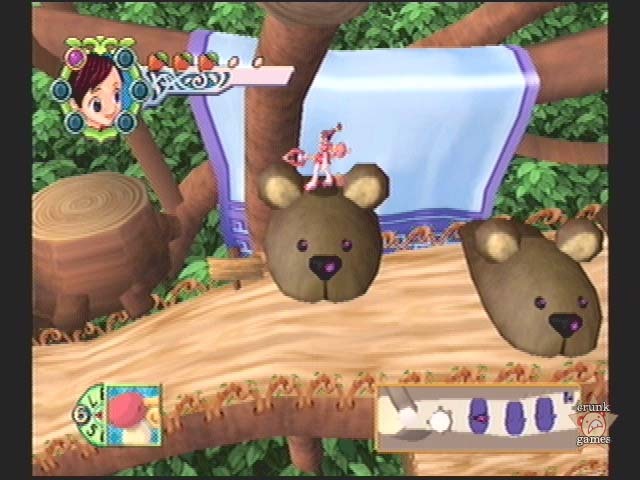 Napple Town is inhabited by a colorful cast of characters, both literally and figuratively. 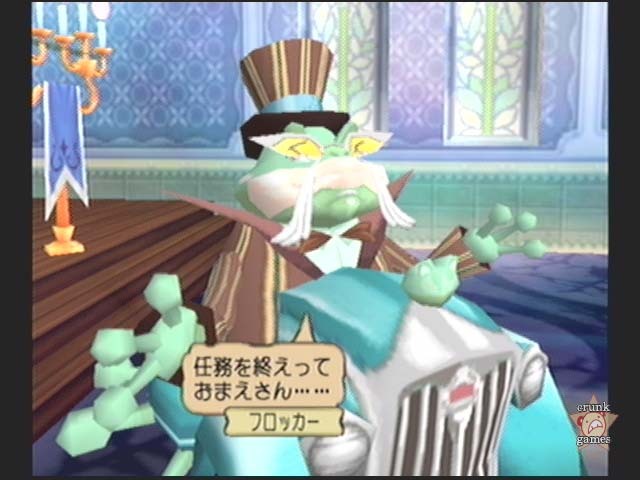 Where should one start … well, there’s the mayor of Napple Town, Frogcar, a level-headed old amphibian who has a car for a lower body. There’s Jackson, a male cow who talks flamboyantly and runs a milk bar. There’s the weird old lady who’s named Winky … oh, and of course the town’s schoolboys who wear puffy pants that unsettlingly resemble diapers. we kind of just revealed the more "out there" characters, but there’s still a few weirdos for Poach to run into, plus a healthy dose of more humanoid NPCs. Although Sega calls it an action RPG, Napple Tale isn’t that close to one. Sure, the game is about 50% quest-triggering, but is still a platformer through and through. Fans of Klonoa and Clockwork Knight would feel at home with the excellent blend of 3D freedom and 2D principles reminiscent of those series. 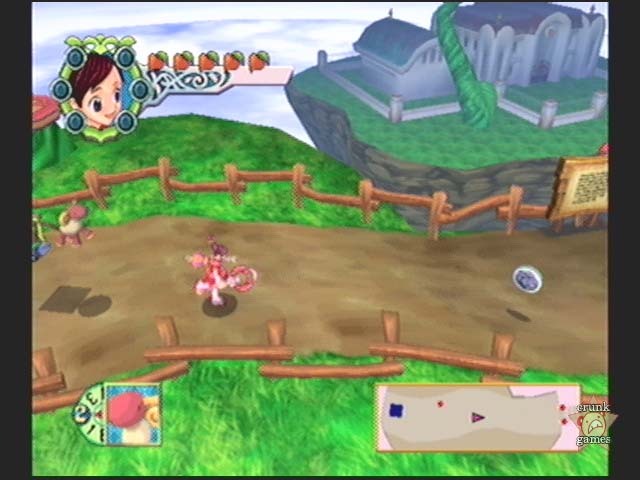 When beginning the fun, there are four roads in Napple Town, each one leading to a different gate based on the four seasons. The gates hold a varying number of levels that are all a barrage of moving floors and tough jumps. A boss holds court at the end of every level, a cursed monster that Poach needs to defeat and return to normal. A boss may also hold one of Poach’s Petals which when earned will finish up that season for good. The thing is is that all this platforming is incredibly easy. Whether this is on purpose to appeal to its target audience or not is unknown, but anyone who can beat Super Mario Bros. (or hey, Klonoa) will be shocked at how much of a total pushover this game is. This is weakly made up for by dragging out virtually every stage, starting with the general length and adding on blocks in the path that need to be cleared by backtracking. Poach’s pre-stage stretching animation doesn’t speed things along any, either. There is the secondary path every now and then, but it remains straightforward "walk here, jump over there". The bosses that cap each stage aren’t any better, with brainless patterns that would have even Megaman wondering what the hell is up. Granted, if you don’t know where to go next because you don’t know Japanese, the difficulty can be artificially raised, but that’s no excuse! Somehow though, when you let the angst go, it remains fun. It could be the music, the nutty enemies or more likely my rose-tinted love for all things camp, but something clicks and it becomes enjoyable, even for its short while. Of course, what modern video game would be complete without a Pokémon element? 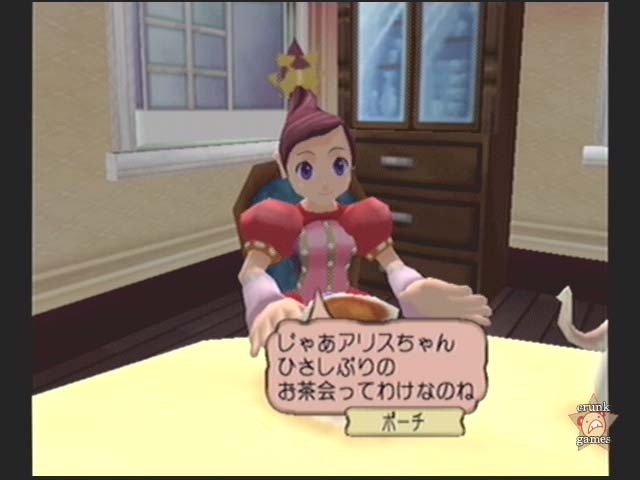 Napple Tale has its own variation of species collecting in the form of Paffets. Paffets come in both creature and furniture types, the former helping Poach along in the game’s action bits. Paffets are created by collecting items known as MIS, which contain hidden items themselves and make up the "language" that the Paffets speak. There are also special Paffets that Poach acquires after recovering her Petals. You must also hunt down recipies for the Paffets and take everything back to Poach’s home at the ice cream shop 13 Ice, and from there take an MIS and "decode" it. Decoding consists of looking through a scope that finds the hidden items in the MIS and extracting them. For example, if you have a model plane you may have to turn it over to the back end to find an item hidden on the tail wing. Furniture Paffet are little more than fetch quest fodder or take up residence in the archive room, but the creature Paffet each have their own abilities that can often aid Poach in the action levels. Then again, considering the feather-soft difficulty, why you would need any help in the first place is beyond me. Therefore the entire Paffet concept turns out to be more or less dead weight. As previously mentioned, female influence reaches far in Napple Tale, further than you may think. Famed anime music composer Yoko Kanno also lends her skill to the game, producing a set of tunes that can make instant fans of hers. Recorded in both Japan and Italy, Kanno’s usual bouncing around of genres remains in Napple Tale, but sticks to a juvenile chord for most of the tracks (some seemingly lifted right out of Mr. Rogers’ Neighborhood). Still, a fair number of songs run the gamut from mariachi to jazz to chants to simple piano melodies. Basically, if you can think of a style befitting a storybook-like video game, it’s probably covered here. Additionally, there are a few vocal themes sung by prolific voice actress (including the voice of Poach) Maaya Sakamoto. To say that this game has good music is severely understating it; if you have the ear, you will agree that this is truly one of the most accomplished and fulfilling video game soundtracks in recent memory, perfectly joining the game’s own creatively free universe. With a soundtrack as great as Napple Tale’s, settling for just one album would be out of the question! Actually it wouldn’t, but there’s still two volumes of the Napple Tale OST, Yosei Zukan (Illustrated Guide to the Fairies) and Kaiju Zukan (Illustrated Guide to the Monsters, shown). Both are fairly easy to find at online import stores and cheap if you get the bootleg versions, you freedom-hating jerkoff.